Get hot, 81: Still sick. I'm still sick, but no longer on Death's door so I'll be going back to work tomorrow. I had a lot of free time these past few days but was half delirious with fever through most of it. 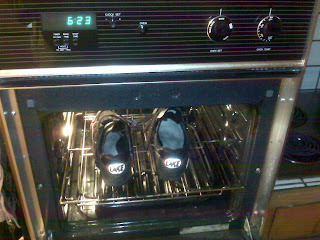 I did manage to do something I'd really been meaning to do though: clean my shoes. They'd gotten to the point where I had to take them off at the front door when I got home and leave them outside overnight. Their smell was unforgivable. I soaked them in a bucket with water and bleach for a few hours then dried them in the oven. Now they smell pure again. It's back to socks for me. As much as I like going without, I simply can not handle that foul stench. I call that living good!